Depending on their type, PeopleSoft Virtual Images can be used for application maintenance, demo, training and upgrade activities. 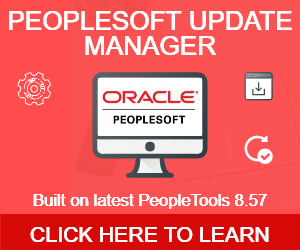 Over a period of time, you may end up making changes to delivered PeopleSoft virtual images. To avoid losing any changes that you made, you can take backup of your PeopleSoft virtual image and Oracle Virtual Box provides very easy way to do the same using snapshots. Open Virtual Box and select the virtual image that you want to backup. Make sure you shutdown the virtual image first. Though you can take snapshot even when the virtual image is running but I would recommend to shutdown the image. After selecting the virtual machine, click on ‘Snapshots’ tab as shown below. To take the snapshot, click on button that looks like a small camera. Refer to above screenshot. Enter the details for the snapshot. You’ll be asked to enter these details just for reference purpose so that you can remember the reason why you took the snapshot. Click Ok.
Once this is done, you should see new snapshot entry as shown below. You can take as many snapshot as you want and always revert back to that state of virtual machines. 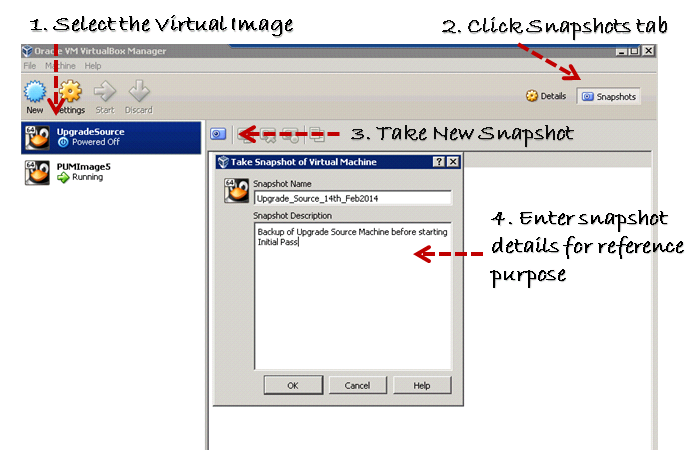 Whenever you want to restore the virtual machine from a snapshot, simply select the snapshot from the list and click the restore button as shown below. All the changes that were made to virtual machine after that snapshot will be reverted and machine state will be restored.